Curaçao-born Benschop moved abroad in July 2012. The forward signed a 4-year contract at French club Stade Brest until 2016. In summer 2013 he went on a season-loan to German outfit Fortuna Dusseldorf. After a good season, the club used to buy option and sealed Benschop until 2017. Benschop did very well at Fortuna Düsseldorf scoring 25 times in 58 league games in two seasons. 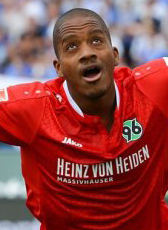 Hannover 96 decided to buy him for an amount of 2.4ME. Benschop signed a 3-year contract until 30 June 2018 at the club from Hannover. In his Hannover seasons he was not so successful anymore. He relegated with the club in the 2015-16 season, but won promotion in the next season. His contract was not extended in 2018 and Benschop moved to 2. Bundesliga club Ingolstadt on a 2-year contract. In January 2019 he returned home to play on loan for the rest of the season at de Graafschap. In the first half of the season, he scored just once in 9 matches for his German club. Did you know that he is married to his German language teacher?